Music has long been known to bring people together irrespective of language barriers, and few situations require people to come together as crucially as those in which our lives are at stake. 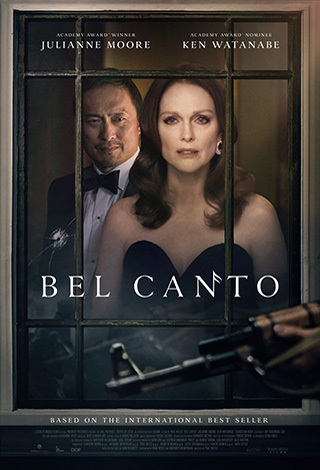 Based on a real life hostage incident in Peru, Bel Canto (“beautiful song”) was originally a book written by Ann Patchett about this very ability of music. Fittingly, it was then made into an opera, and has now been cinematically envisioned by Paul Weitz (“Grandma”). With an extremely talented cast and the beautiful voice of Renée Fleming on the soundtrack, Bel Canto has some great elements, but ultimately doesn’t deliver the passion and tension one expects from an homage to opera. Wealthy Japanese businessman Katsumi Hosokawa (Ken Watanabe, “Godzilla”) travels to an unspecified country in South America, where famous opera singer Roxanne Coss (Julianne Moore, “Suburbicon”) is to perform at a private party. When the party is taken over by a group of militant rebels looking to kidnap the President, the guests become hostages to be used in a battle for power and freedom. There is a wide range of nationalities present, and not many shared languages, but in light of the stressful circumstances, it isn’t long before moments of human connection begin to blossom between both hostages and rebels. One of the biggest strengths of Bel Canto is its ability to examine and treat characters as multifaceted individuals: People who want more than one thing, and sometimes want conflicting things. Hosokawa is not simply a cold-hearted businessman, but a fierce lover of opera. A young rebel, Carmen (María Mercedes Coroy, “Ixcanul”), is not portrayed as a stereotypical terrorist, but a woman who wants to study, experience new things and better herself. It is the interactions between these characters that forms the heart of this film, and there are some truly special moments throughout. Ryo Kase (“Restless”) stands out here as Hosokawa’s translator, Gen, as he becomes a crucial point of connection between the two sides. Whether it’s Gen talking to the rebel leader, or him spending more time with Carmen, it is through his eyes that we begin to understand the humanity of these supposed terrorists. Simultaneously, his interactions with the other hostages is what helps them discover their shared strength and capability to survive the situation. On the other hand, while Moore and Watanabe are fantastic actors and bring a fascinating depth to their characters, their connection is written in an undeniably forced manner, with little care given to actually developing their chemistry. This leaves us feeling disconnected from their relationship, which is disappointing given the potential intimacy both actors bring to the table. Despite the intensity of something as dangerous as a hostage situation, Bel Canto occasionally enters into tedious moments that take the audience out of the setting and consequently, feel distinctly contrived. As much as the characters strive to pull us into their experiences, the script keeps us at arm’s length. This is most visible due to its inability to effectively convey the passing of time, and means that even when something important occurs, we are unable to understand how much time has passed and what this means emotionally for those involved. The film’s saving grace in this regard is the music. Moore does a spectacular job miming to Fleming’s voice, and both manage to transport us to a moment outside of time, where the details seem to matter less than the emotions being felt. One could argue that Bel Canto is a strong piece with a few minor flaws, but these few flaws bring a lack of momentum that unfortunately cuts the film’s legs out from under it. There is no better example than the wonderfully powerful climax which is swiftly undermined by a clichéd final scene. So while Bel Canto is beautiful, it doesn’t do justice to the song.